Today is the birthday of my wonderful sister, Heather, who is just getting interested in food, cooking, and baking! 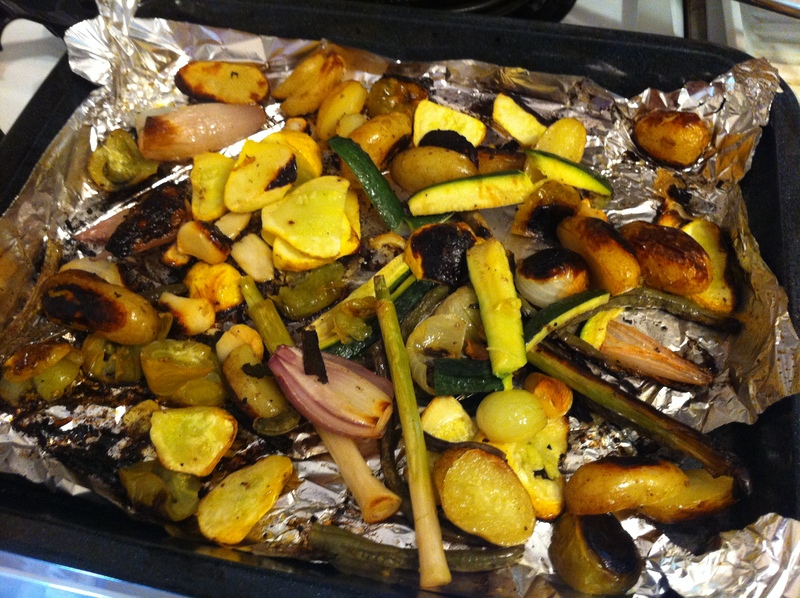 And there is one thing I think every sister needs to know — it’s how to roast a tray of veggies. If you know how to roast vegetables, you can do so many wonderful things with them: eat them as they are, eat them over top of quinoa or rice, put them on top of a salad, use them in a sandwich, make them your pizza topping, blitz them into a soup, enjoy them with pasta, put them on puff pastry as a party appetizer… roasted veggies are the best. And they are so easy to make once you know the secrets. Line your tray with aluminum foil. As long as it’s as big as the baking sheet, you won’t have to clean up any mess. Just throw away the foil and put your baking sheet away when it’s cool. Any temperature between 350-425F is going to work for you. So if you have something else in the oven at the same time, put the veggies in at whatever temperature the other stuff needs. The higher the temperature, the faster they will cook. If you’re going to walk away and do other stuff while the veggies are roasting, set a timer to check often, and use a lower heat (350F is great if you don’t know what to pick). If you like a vegetable, it will be good roasted. You never have to use a seasoning beyond olive oil, salt, and pepper. But if you want to, put on some herbs or spices you like. Some suggestions are at the end of this post. If you cut things to be the same size (approximately), they should all cook in around the same time, saving you from uncooked big pieces and burned little pieces. Tongs make flipping everything easier. Heck, tongs make everything in the kitchen easier. Adding something starchy (potatoes, squash, sweet potatoes) makes a plate of roasted veggies more filling. Adding a clove or two of peeled garlic makes a plate of roasted veggies more delicious. Roasting veggies is one of those things you can do when you get home from a long day at work and are too tired to cook. Put some veggies in the oven and set a timer to check on them in 20 minutes. Go do something relaxing. It’s ok to buy pre-cut veggies. There are even packages of “vegetables for roasting” you can buy. Fresh veggies usually work out better texture-wise than frozen ones. If in doubt if you can roast something or how long it will take, google “roasted [insert name of vegetable here]” and see what the wisdom of the internet tells you. Or just put it in the oven and see if it gets more delicious over time. Preheat oven to 350F, and line a baking sheet (the same one you use for cookies will be great here) with aluminum foil, shiny side up. While the oven is preheating, chop up your vegetables. Set up a discard bowl for compost/garbage bits and a big bowl for the bits you’ll eat. Try and chop everything to about the same size, but don’t worry too much about it. Put your chopped veggies into the big bowl. Add the olive oil, salt, and pepper, and mix up with your hands (or a spatula, tongs, a wooden spoon, or a big spoon), until all the veggies have a coating of seasoned oil. Pour the bowl of veggies onto the foil-lined baking sheet. Distribute them evenly in a single layer across the surface of the baking sheet. If they don’t all fit, get out a second baking sheet (and line it with foil) and use that. You want a single layer of vegetables without cramming too many in there. Bake at 350F for 30-45 minutes. Set a timer to go off after 20 minutes, then check on your vegetables. They will likely need more time — to tell if they’re done, see if they are tender when you stab them with a fork, or if they are delicious. (Warning: they may be hot enough to burn your mouth straight from the oven.) Set a timer for 5-10 minute intervals after that, to remember to keep checking on them. Finished veggies will have lovely brown bits and generally be soft. Remove the baking sheet from the oven and leave in a safe place to cool. Enjoy! Come join me in my online video class! mmmm – I like your pesto veggies idea, as well as the roasted parsnips and carrots! My favourite roasted veggie has to be the Brussels sprout (with a hint of maple syrup). Roasted cauliflower is amazing too. Roasted cauliflower is also one of my absolute favourites. I swear I can eat a whole head of cauliflower without thinking about it! I keep forgetting about millet! Thanks for the reminder, I love it (and buckwheat groats too!) — I think that might happen for dinner one night this weekend. Happy Birthday to Heather! It’s so lovely to have a sibling that shares the same interest in cooking, food and baking! I wish I have a sibling like that. The roasted veggies dish look so good! It’s totally the best to be able to get into the kitchen with a sister 🙂 We always come up with the most delicious things! 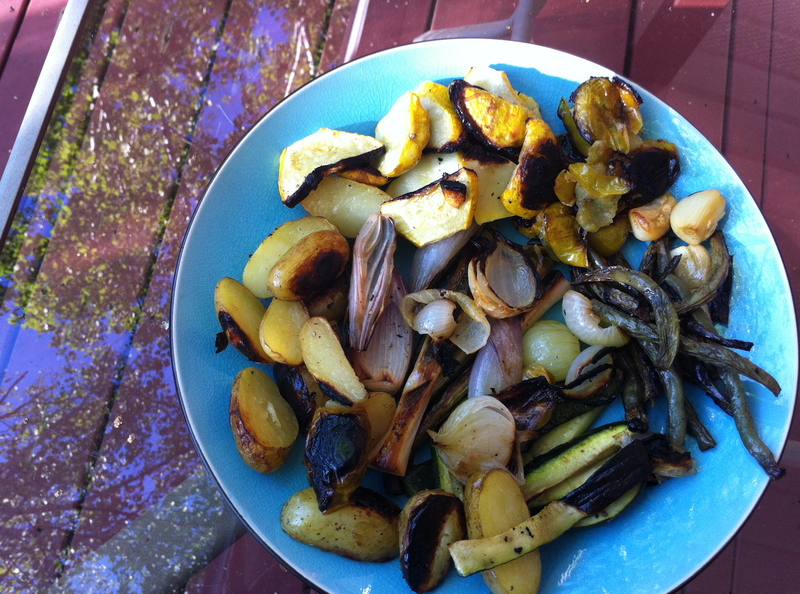 The roasted veggies were particularly awesome — we ate them atop a (gluten-free) multi-grain pizza crust, sitting on the porch of a friend’s cottage. Perfect.